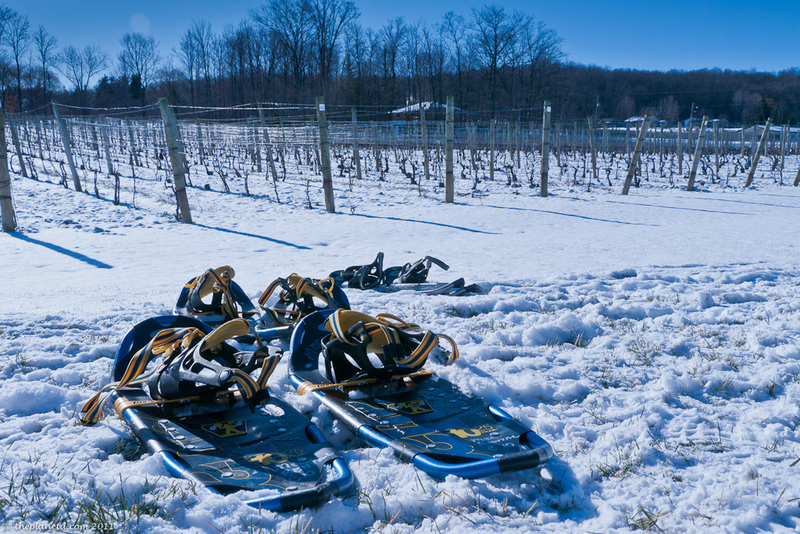 This is the first time I have heard of sampling wine in the dead of winter while snow shoeing through the picturesque Niagara Winery estate of Thirty Bench Wine Makers in Beamsville. We arrived early on a picture perfect day. The snow was falling hard the day before and there was just enough snow in the nick of time for Thirty Bench to open it’s snowshoeing excursion for the beginning of the ice wine festival. The first thing we were handed was a glass of wine as we enjoyed perusing the vintages on display indoors. After we finished our glass, it was time to brave the crisp air and suit up for our tour. Janine and Adrienne were our guides for the day and they helped us with our snow shoes. Snowshoes have come a long way since we were kids stomping around the fields after a fresh snowfall. They are now a sleek and modern design with build in crampons to dig into the ice allowing the hiker to keep from slipping.